From small beginnings as ‘The Travel Corner’ in 1992, we have now grown to a team of about thirty individuals who are professional, multi-lingual, and friendly. Our Travel Experts are knowledgeable about our villas, hotels, self catering with pools and destinations – many have lived in the countries that they now so passionately promote. Furthermore, they have a unique insight of each place and its surroundings, having personally visited each one, enabling them to guide our guests to their perfect holiday. Our belief in old-fashioned personal service and meticulous attention to detail remains unchanged – whether a guest requests a bath with a view or a cook who can prepare local specialities – and has earned us an enviable reputation as one of the most respected villa holiday companies. Guests come to us via recommendation or have rented Villas, Hotels, Self Catering with pools through us in the past, some over many years. 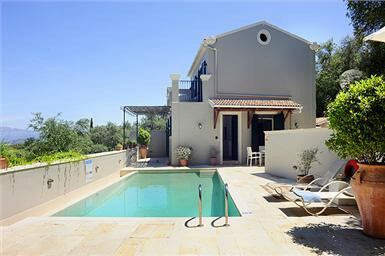 Our company offers a wide selection of luxury villas with private pools on the Greek Islands. We mainly specialise on the island of Corfu, in particular the region on the beautiful north east coast. This select area includes the stunning resorts of Kassiopi, Aghios Stephanos (or St. Stefanos), Avlaki, Nissaki and Agni. Most villas have fabulous sea views and/or stunning mountain views. Houses are complete with comfortable lounge areas, dining rooms and modern, fully equipped kitchens. All have private swimming pools, ensuite bathrooms in most rooms and outside dining areas with barbecues. The luxury of our Private Collection villas is second to none, ranging from the stylishly contemporary to the opulently elegant. Your Travel Corner experience begins the moment you book your villa from our unique handpicked Collection. Our seamless Pre-departure Services take care of the details, from VIP airport parking to a dinner reservation for your first night. Nothing is too much trouble. And when it comes to your villa, Exclusive means contemporary style and matchless views, combined with discreet, personalised service that comes to you, from private chefs to massage therapists. Have you ever thought about what your perfect hotel would be like? You’ll surely find it at The Travel Corner, as we can make arrangements for any kind of hotel accommodation around Greece, on the mainland and on the islands. We have a large selection of excellent hotels on beautiful islands such as Corfu, Rhodes, Crete, Zante, Kefalonia, Skiathos, Santorini, Mykonos, Skopelos, Alonisos and many more. The lovely mainland resort of Parga is also a very popular destination. Our selected hotels vary from 3* to Boutique and 5* Luxury hotels anywhere in Greece. The main cities of Athens and Thessaloniki are also great destinations with a super selection of hotels from which to visit the sights and attractions. A holiday, a business trip, a getaway, a long weekend… No problem! With our hotel finder, all you have to do is enter the date and pick your ideal hotel. You will find the lowest-priced accommodations quickly and easily. Then, all you’ll need to do is choose the room type that best suits your needs. Whether you’re looking for a centrally-located hotel, accommodations that allow pets or a room with a view of the ocean or the mountains, it’s all there in our hotel finder. And if you aren’t sure where to go on your holiday, let our wide selection of the best tourist destinations and accommodations inspire you and let the best deal be your guide. The reservation possibilities are endless, but you’ll always find the hotel you’re looking for at the best possible price. Aside from the luxury villas there is also a wide variety of simpler villas and houses available for rent. Some of these properties are very close to the sea but many are located further inland. Our guests' comfort is a priority and all accommodation is selected with this in mind. Even the smaller houses offer a large degree of comfort, from comfortable and relaxing lounge areas to quaint little barbecue areas with smart outside furniture. Some of these villas are located close to the resorts and some are further away, again requiring car hire. Many guests look for a villa with specific criteria in mind whether it be a villa near the beach or a villa in a secluded location, a family villa or a romantic retreat, a villa with a gated pool or a villa with lawned gardens. To help our guests choose a villa, which not only meets their requirements but also ensures that they make the most of their villa holiday, The Travel Corner has placed a range of villas into collections based on their suitability. Please browse the relevant categories on this page of The Travel Corner recommendations which also include those villas which enjoy a cook service, those villas with a tennis court, those villas in walking distance of local amenities, and many others too, and then do call one of our knowledgeable and friendly travel experts who will be happy to help you make the perfect villa choice. For those wishing for a good base from which to enjoy their holiday, self catering accommodation is a wise choice, particularly for groups and families. Our company has a very wide choice of comfortable properties, with and without pools. Much of this accommodation is located quite central to resort and often within walking distance to all amenities. All self catering accommodation has well equipped kitchenettes, bathrooms with private wc and most have balconies or small veranda areas. Some rooms have a small lounge or dining area. Self catering accommodation is generally within a small complex consisting of other apartments and studios and share a central swimming pool. Some of our accommodation has the added bonus of being on, or very close to, a beach.